Post Game Thread-Super Bowl Champs!!!! 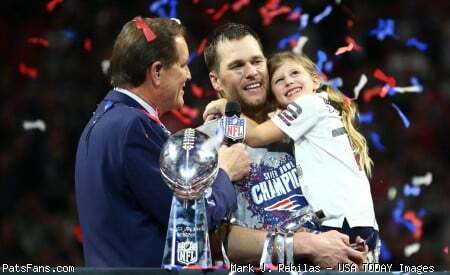 Discussion in 'PatsFans.com - Patriots Fan Forum' started by ashley1992, Feb 3, 2019. Those guys averaged almost a tie per season. No OT back then? I'd like to see BB get a tie someday (if it doesn't hurt our playoff standings). Why would he want to tie when he can simply win every OT game? I'm imagining one of those weird scenarios when the Pats could knock Pitt or Baltimore out of the playoffs and with a win OR tie ... and then for once it ends up happening on a tie. It would be great to see those fans even more pissed with us than usual. Interesting. Tom needed six to pass Starr, and Bill needs a seventh to pass Halas and Lambeau. I really want to see BB pry the wins record from that crabby fraud in Miami, before that fraud dies. It’s like a Gus Fring / post-stroke Hector Salamanca scenario. Shula (the leader of the Asterjerks) is only in the discussion because of his longevity. If he didn't have 10 more years as a HC than BB he'd already be in BB's wake. That reminds me, I need to update my coaches spreadsheet. Just to give an idea how impressive the team fared in these playoffs I thought id post the yardage totals for each game. I know yards dont tell the whole story but it really should have been 3 easy wins against the toughest competition. Pretty interesting and impressive to dominate the stats like that, but the turnovers/ points left on the field negated alot of that. I was ironically coming back from picking up my Superbowl Champs shirt when this billboard greeted me in NOLA yesterday. a lot of people around here aren't getting over that call for a long time. I can't blame them, especially after the heartbreaking way they lost last year. I won't be getting over that non-call for a while either. I can only guess how this board would be now if it were the Pats, but I'm sure it wouldn't be pretty. Yo i haven't seen this yet!!! where in Nola? Just remind Saints fans we are 2-0 against them in the most recent games...and that we have beaten every NFCS team in the SB except NO and they are next. I believe the Pats were the first team to have a cumulative >500yd differential over 3 playoff opponents since the 1989 49ers. Juggernauts, both. I honestly just laugh and say "yeah you guys got hosed, would have been a good game, we still would have won." That one was in Metairie on Vets between Causeway and Clearview and I saw another on the interstate going towards Carrollton earlier from Lakeview. They are the electronic ones so they rotate like 7 different things. NOLA.com tried to simulate the Patriots vs Saints. It, uh, didn't go so well for the Saints. Not the Bucs, either, but there’s still time. Saints would have been the tougher matchup, which is why I had been rooting against them all year. Michael Thomas is one of the few players who would eat Gilmore alive, and even double teaming him doesn’t always work. The guy is a freakin beast, maybe better than 2016 Julio Jones. The Rams had a couple of B+ receivers against a great Patriots secondary. They needed Cooks to be the $17M A+ receiver they paid for, but we all knew that wasn’t going to happen. The absence of Kupp and Gordon probably made that game completely different than it would have been with both players available. Boy did the Pats luck out not having to face Brees.